Don't you love this month's Visiting Teaching Message!! The Enabling Power of Jesus Christ and His Atonement is really quite remarkable. I, myself did not truly understand this function of the atonement until I was an adult. 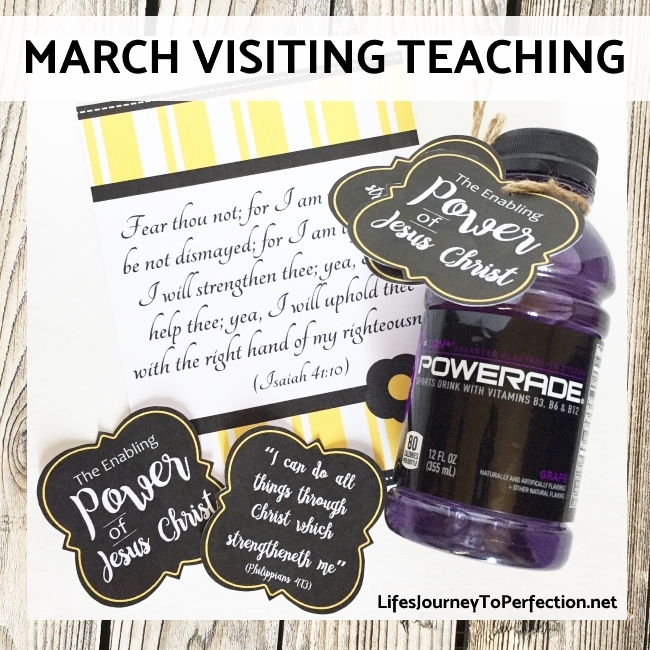 As a youth I heard a lot about the healing power and saving power of the atonement. I knew that Christ had suffered for me and I knew that because of that I could repent and be forgiven of my sins. It wasn't until I began to study the atonement that I understood all of the other things it does for us. One of which, being the enabling power it gives us. I love Ether 12:27, "...I give unto men weakness that they may be humble; and my grace is sufficient for all men that humble themselves before me; for if they humble themselves before me, and have faith in me, then will I make weak things become strong unto them." Our weaknesses and trials are given to us, so that we may be humble and strengthened! For me the times I have drawn the closest to my Heavenly Father and Savior are during my weaknesses. 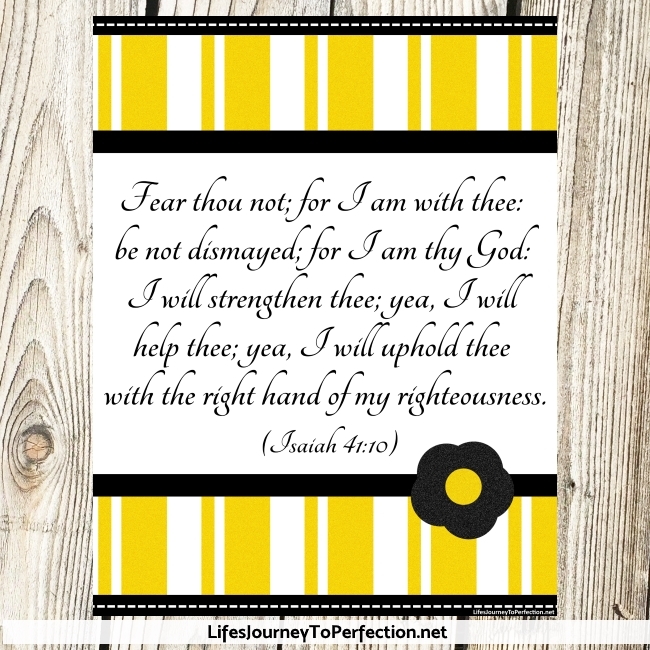 When I have had to humbly come to them and say, "I really need thy help. I can not do this by myself. Please help me, give me the strength to know what to do." As we are humble, we are teachable. We are more receptive to the guidance of the spirit. Our hearts are more willing to submit to the will of our Father in Heaven. 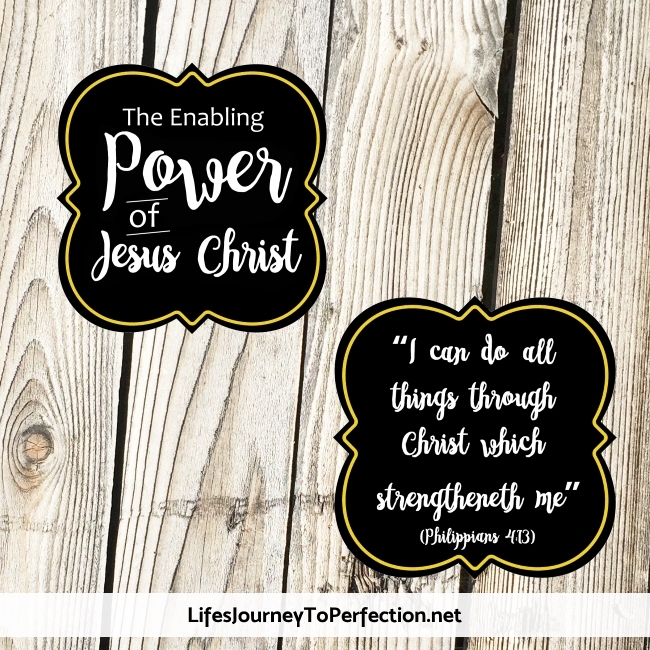 The Savior and His atonement, gives us the power to overcome our weaknesses. Not only overcome them, but work towards turning them into strengths. For instance, when I was called to work in the Young Women's presidency, I felt quite inadequate! I had never served in Young Women's before and I really desired to be a good leader to the girls. Several times I have prayed to my Father in Heaven and asked Him to help me be the leader these girls need. I really rely on Him as I serve them. I know without any doubt that it is through the enabling power of the Savior that I can continually become a better leader. Didn't the Savior overcome the world! Surely he can help us do all the things that are required of us! Attach to a thing of Powerade or some other item you think portrays strength or power.